BROOOOOOOOOOMS! 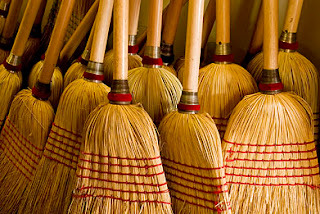 Glorious Brooms! Who loves the brooms as much as I do? Are you as shocked by Minor not imploding on the mound as I was? How crappy was Miami at plate? They went 0-13 with RISP, that's how bad they were. Look, I'm not going to go over the top and declare that Minor made a statement last night. I'll leave that to national media shockjock types who love to stir the pot. Mike did a good job holding things together for 5 innings, but he's still getting sent down. He's not there yet, but at least we saw a flare of improvement before he goes to AAA, and that gives me more hope than I have for JJ right now. There's a real chance Minor could be ready to go by the time we get to the 40 man roster, given enough time to work out his location at Gwinnett. There's a few things to address about last night. For those of you who say, "Yeah Ben, nice call on saying to leave Heyward out of the lineup when he hits two bombs." First, don't be a jackass. Second, take note of WHO Heyward hit the homers off of. Both of them were late in the game against right-handed relievers. He still can't do jack against lefties, and Buehrle had him handled for his first two ABs. Also, in that regard Buehrle got a raw deal. He went 6 innings with only 3 hits, but somehow due to Marteeeeeeen going deep on his one bad pitch, he left the game down a run. The bullpen for Miami is the one who completely self-destructed and put the game out of reach. I love Bourn, but if you're giving up homers to our leadoff guy, you've got issues. Now to the MVP. You might think Bourn, Prado, or Heyward for all their hitting. You would be dead wrong. The MVP of the game was our SS noob Andrelton Simmons. Simmons went 2/3 with a walk, and he started possibly the most spectacular double play you'll see out of the Braves all season. That's not hyperbole at all. If you haven't seen it, go look it up because it's ridiculous. A ball was smashed on the ground to his right, Simmons makes a diving snag with the glove, and as he's falling over on the ground he makes a sharp throw to Uggla who makes a quick turn to Hinske, who digs it out falling over just barely holding the bag. It was surreal. Everyone in the stadium and the announcers booth had their jaws drop. Again, if you haven't seen it, look it up because it's crazy. Oh, and to top it off in the ninth, Simmons wanders out into center field and makes a backwards over the shoulder basket catch for an out. What?!?! This kid is beyond superior with the glove. Now for everyone's favorite, THE STAT OF THE SERIES! This time, the stat is...STARTER ERA! Hudson, Delgado, and Minor probably had their best starts of the season in this series. The Starter ERA for these three games was, get this, 0.89 combined. Tell you what, I'll go out there with that every single night, and we'll never lose another game all season. Holy smokes, I can't begin to tell you how good that is. It's shades of the 3 Aces back in the 90s. So tonight we honor John Smoltz by retiring his number. I will be there. There is the possibility it'll get a little misty. The only downside is the actual game is against the Blue Jays, and I hate interleague with the fiery passion of 1000 suns. Interleague, the DH, Tim McCarver, and Joe Morgan. These things drive my rageometer into the red. So, go out there tonight Braves and win one for Smoltzy. I won't be doing a preview because there's no point in previewing interleague. Oh look, he's a pitcher we've never faced against our pitcher they've never faced. I might as well get out a crystal ball and smash it against the wall. I HATE YOU SELIG! You and your interleague and your stupid All Star game deciding the world series and the dumb wild card one game crap. We can have all that, but we can't have replay to prove Angel Hernandez and CB Bucknor are freaking morons as umpires. God no. Human element! Up yours, Selig, and see you at the game tonight Smoltzy!